45 Pound Air Rock Drill Rental – Sullair MRD-40, is available for rent in Rochester NY, Ithaca NY and the entire Western New York region from the Duke Company. The rental MRD-40 is a highly capable and powerful rock drill available to rent. 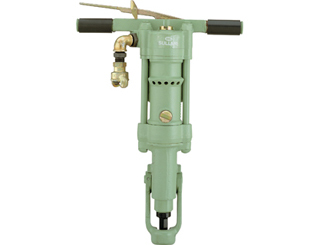 Powered by an air compressor, and with only two moving parts while operating, this drill does not require special rock drill oil. The single throttle lever controls all functions. Features include a dead man safety handle, one control for drilling and blowing, variable throttle control, continuous hole cleaning, direct rotation of the piston.